Imagine the possibility! the three eastern lanes of Dyer Avenue (between 34th and 35th ) could be closed to traffic and used to create a park. The remaining three western lanes will carry the traffic . Over the summer a group of residents gathered to create a “vision”. 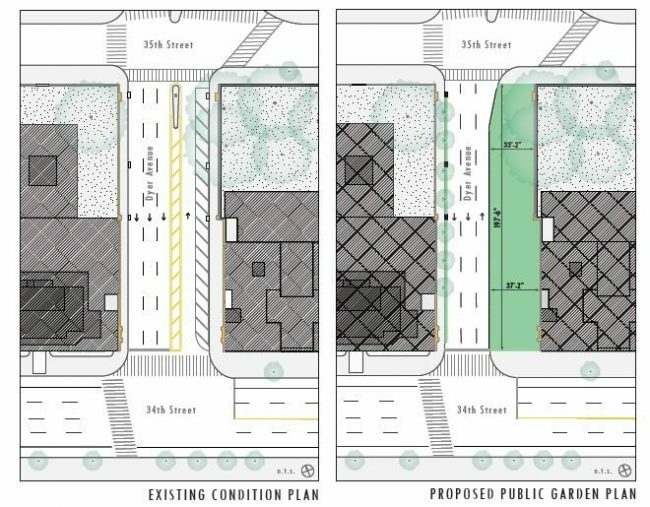 The Full Board of CB4 will vote on their request that the three traffic lanes be relocated to the west and the traffic island be removed in order to create a park space. To speak up sign in when you arrive. It will not take more than 30 minutes. There will be two town halls to collect the wishes of the whole community for the final design of the park. Those will take place in the first half of 2013. This entry was posted in 9th Avenue Renaissance, CHEKPEDS, Events, Greening and tagged park-plaza. Bookmark the permalink.